Liesbet is from Brugge Belgium. This is her first time in the USA and San Francisco was her second workshop stop. She first taught in LA and went to Monterey for the next before heading home. A full workshop with an extra..me, who had a last minute change and was kindly allowed in. It was intense but wonderful and I learned a lot. Everyone did a great job. 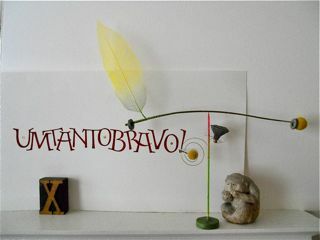 Here is a photo of my piece 'Um Tanto Bravo', the name of my farm in Castelo Da Vide, Portugal. It is photoed with a favorite piece made by my friend Mel Furukawa. He made this piece so that the horizontal piece balances on the vertical support by its point and with the air currents it rotates: no glue! I was so fortunate to be given it. The porcelain monkey was my husband's as well as the wooden X letterpress piece.